Tucked away in the back of the cemetery is a shaded section of graves shaded by rhododendrons and a lichen-covered stone wall. 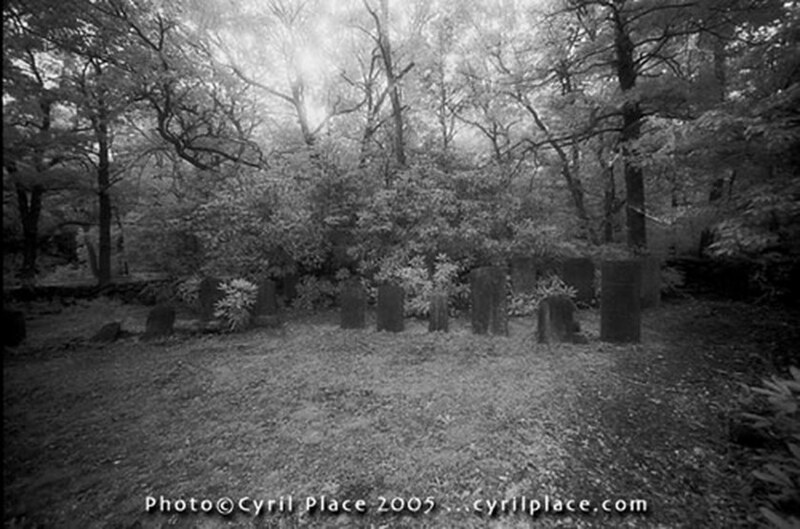 In his interview with Dan and Gary, Ellis shared that this was "the most haunted part of the cemetery." Over the years, he has noticed an incredibly pungent odor of cigar smoke and wonders if it's not the late Emory Ellis puffing his cigar. ​The section consists of several graves uprooted from Collins Farm Cemetery, which was forced to move when the Cape Cod Canal was built in the early twentieth century. According to Jerry, Emory Ellis was a character who held off the state and the dredgers and the diggers with a shotgun at the entrance and wouldn't let them move the cemetery because it was a family plot. Finally, he relented after certain amounts of money passed hands, and in 1909, here it came. "In my lifetime Iíve experienced it maybe twelve times," says Jerry. "It's very distinct. You cannot distinguish it as anything other than cigar smoke. It's not cigarette smoke, and I don't smoke, personally. So, when you get that smell, it's there. I would go to court on it."